Live Creating Yourself. 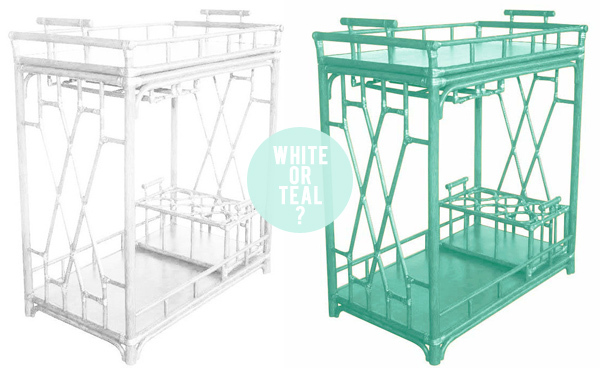 : Help Me Choose a Society Social Bar Cart: White or Teal? I'm smitten with them both but I think I'd go White!! I love your apartment Alaina. It's been fun to see the transformation! I wouldn't say that white is a safe choice...think of it as a perfect canvas for your ever changing relationship with colored accessories! eeek! So excited for you. I just got one too... I got the gold madison with a white tray. If I were you I would actually do teal, because it's a fun pop of color with all the white you have going on. But you really can't go wrong. While the teal is a super cool and fun color, I would agree that the white will probably last you longer since it is neutral. White! I think definitely white! I love the teal but white suits your space and style so much more! I'm so jealous! I want one of those bar carts like nobody's business. I think the teal is amazing but I gotta vote for the white. There's going to be SO much color once you add in all the bar accessories that I just think the white will be a better backdrop. Either way you really can't go wrong though. 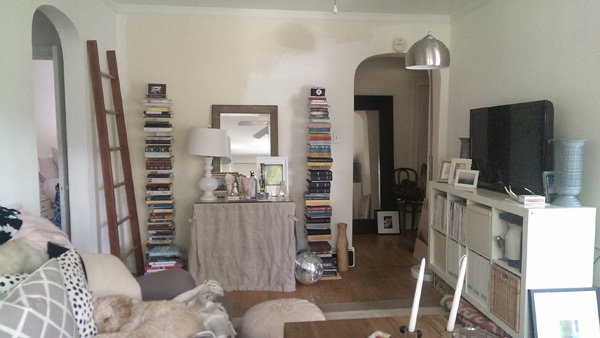 I love seeing your decorating process! Also your pics look fine to me, I don't see any shadowy stuff. white! it will be a better backdrop for your colorful bar stuff! teal! bring some color in!! I'd go with the white! Let the pretty bottles and fabulous barware be the pop of color! Such a fun addition! 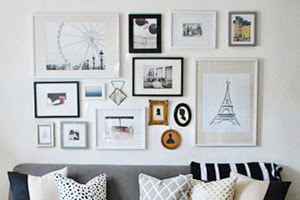 Blogger recently started doing that to some of our images and we have switched to .png files (with the same white background) instead of .jpg files and it seems to have corrected the problem. Have you tried that? Good luck with the fix and with the decision! i absolutely love the teal, but for down the road, you should probably go with the white. It will have so many different ways to be dressed up! This is a hard decision!! good luck! so jealous! i am been lusting over roxy's bar carts forever. (i even have glasses stashed in my closet for the day when i finally can buy one.) i vote for the white because it will always look classic and chic. it will look so great with some pretty glasses and fun straws and maybe some flowers. I definitely vote for the white, although you're so good at decorating with color that I'm sure the teal would look lovely as well! What about choosing the teal, for current fun times, and you could always paint it white down the road if you need to? I agree that your living room could use a pop of color! Go teal it's so pretty and would add a pop of color, you can always paint it white down the road if you get sick of teal. Definitely the white! It's so classic, and you can always dress it up with colorful accessories. It'll last you so much longer. I looooove bar carts, I'm going to have to vote for teal, I know I know, white is practical, but that poppa color would be wondrous (you totally want to go for teal, you WANT us to tell you white), nosiree lady, teal Teal TEAL! I did a lil post on bar carts, and I've loved your previous posts about your little home bar. Super cute and styled to perfection. I would go with white! 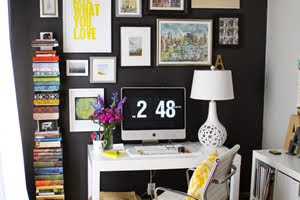 You can always add color or work around design changes down the road...but, the pop of color is a fun risk! Either one will looks great. I vote teal simply because it sounds like that's what your heart wants, and why would you ever not go with that? ;) Either way, it'll be an adorable addition to your space! LOVE BOTH! But I have a feeling you will go with white because it's more practical, however teal is soooo fun! But really, you can't go wrong. Go for white! You can use it with any color scheme you have down the road. Sounds like you've already talked yourself into the white. Either way you go, I'm sure it will look fabulous!! White! You can add so many pops of color with accessories on top that it'll be worth it. the teal one!! is going to give such a fun pop of color to your place!! Go with the teal! Hope you're doing well, Alaina. Miss you! I would go with white...don't forget... some beautiful liquor bottles and colored glasses could add the pop of color that you want. Love the cart by the way! I say teal! I just got the worth in hot pink and I'm obsessed!